Every induction cooktop and range in Consumer Reports’ tests delivers fast cooktop heat and superb simmering. The power and precision of induction comes from an electromagnetic field below the glass cooktop surface that quickly generates heat directly to the pan. The difference between an induction and electric smoothtop model is that the surface elements on an induction model heat pots by using an electromagnetic field rather than radiant heat, says Tara Casaregola, the engineer who conducts our tests of cooking appliances. The electromagnetic field doesn’t create a glow, so you won’t know it’s on. That’s why manufacturers are adding virtual flames and other special lights as a cue. 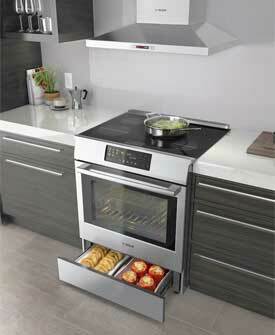 As for the ovens in induction ranges, they broil and bake the same as other electric ovens. Induction elements usually heat quickly, and no other cooking technology that we’ve tested is faster than the fastest induction elements, but we’re talking 2 to 4 minutes faster to bring 6 quarts of water to a near boil. Life-changing? Probably not. However, if you turn on an induction element by mistake with no pot on it, the element won’t get hot, and when you remove a pot from an element the heating stops. And an induction surface stays cooler than a radiant smoothtop, which should make cleaning spills easier. Your pots will get very hot while cooking, and that heat transfers from the surface below and around the pot. So if you’re using several induction elements at once, the surface may heat up, too. Magnetic—or more accurately, induction-capable—cookware is needed for induction to work. If a magnet strongly sticks to the bottom of a pot, it will work with an induction cooktop. Some stainless steel cookware is induction-capable, and some isn’t. The magnetic field of an induction cooktop can interfere with a digital thermometer, so you may need an analog thermometer, an old-fashioned solution to a modern problem.